Honeywell has accused Nest Labs, the fancy new smart thermostat startup, of infringing on Honeywell patents that cover a huge range of energy-smart home functions -- and it’s asking a federal judge to force Nest and partner Best Buy to stop selling the devices. Given that Honeywell just filed its complaint in U.S. District Court in Minnesota on Monday morning, it may be a bit early to ask how the legal challenge will affect Nest and its current and future plans. The startup, founded by Apple design alums with the promise of bringing an iPod-like sophistication to the staid home thermostat market, had declined to comment on the lawsuit as of Monday afternoon, and Honeywell also declined to comment Monday. But Honeywell’s complaint also raises a host of questions for the home energy management industry as a whole. That’s because the list of patents it accuses Nest of infringing on include a set of functions and features that appear to be in fairly widespread use by other companies and partnerships in the industry. Those include controlling thermostats with information stored in a remote location -- i.e., the internet -- which could potentially implicate anyone using “the cloud” to manage thermostats. Honeywell also accuses the Palo Alto, Calif.-based startup of infringing on its “time to temperature” function that tells customers how long it will take for the house to reach a newly set temperature. Other features, like Honeywell’s (and Nest’s) so-called “natural language” capabilities -- that is, having the thermostat display questions that customers can answer to set up the device -- seem to mirror the way other companies are planning to interact with homeowners. And its patent on “power stealing,” or sipping power from the home wiring to charge the thermostat battery, seems like a function most low-power devices would like to include as well. Here are a few more highlights from Honeywell’s complaint, which is asking the court to enjoin both Nest and Best Buy from selling any more Nest thermostats until further notice. That, of course, would be a big problem for Nest and investors Kleiner Perkins, Google Ventures, Shasta Ventures, Al Gore's Generation Investment Management, Lightspeed Venture Partners, and Intertrust, which have invested an estimated $50 million to $80 million in the startup. 1) Publicly denigrating Honeywell may be a bad idea. Honeywell’s complaint highlights several statements by Nest executives claiming that their thermostat is much more advanced than everyone else’s -- and particularly, Honeywell’s. Those comments seem to have rubbed Honeywell’s lawyers the wrong way. To wit, the complaint quotes CEO and iPod designer Tony Fadell as saying, “thermostats are made by big companies that don’t have any incentive to innovate,” and that “there’s been no real innovation in decades.” But Honeywell points out that its patents in question have been on file since 2006 or so. In some cases, Honeywell has used Nest executives' quoted comments to specify just which patents it claims the startup is infringing on. For example, it quotes Fadell saying “our competitors can’t make low-power devices,” then cites its own "power stealing" patent as proof that it invented one key method it accused Nest of infringing. 2) Watch out for the round design. Several of Honeywell’s patents are linked specifically to the round shape that Nest’s thermostat takes. That’s a shape that Honeywell is quite proud of -- in fact, one of its earliest “Honeywell Round” thermostats is on display at the Smithsonian. Honeywell also holds patents on “an HVAC controller that has a rotatable part” to control it, as well as “apparatus for locating a non-rotating part or parts of a thermostat near or inside of a rotating part, while still allowing the rotating part to set and/or control one or more parameters” -- i.e., twisting a knob or a ring to set the thermostat. 3) Showing other companies’ thermostats at your office may come back to bite you. 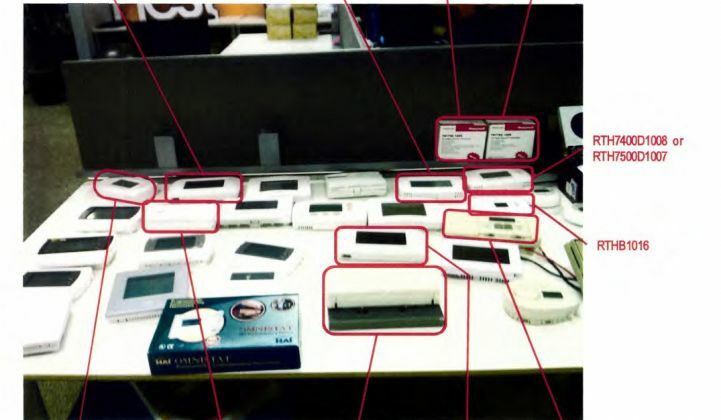 Honeywell’s complaint includes a photograph it took from an online news source, featuring a table at Nest Labs’ offices covered with thermostats. Honeywell has circled what it claims are 11 Honeywell devices on that table, including digital round thermostats and Prestige thermostats protected by patents, and uses that photo to allege that “Nest Labs examined numerous Honeywell devices” in the course of its R&D. 4) Nest hasn’t been completely singled out. Honeywell’s Monday press release notes that it has also filed patent litigation against Venstar Inc. and ICM Controls “for infringing thermostat and combustion controls patents.” While it doesn’t elaborate on those cases, the Venstar lawsuit in particular covers a host of patents related to “graphical user interface system for a thermal comfort controller,” “programmable controller with saving changes indication,” and a few more related to multiple language user interfaces. 5) Controlling thermostats from the cloud could be a bone of contention. One of Honeywell’s seemingly most broad patent claims concerns its Patent No. 6,975,958, for a "Profile Based Method for Deriving a Temperature Setpoint Using a 'Delta' Based On Cross-Indexing a Received Price-Point Level Signal." Whether that means that Honeywell is claiming that its patent actually covers internet-based control of thermostats, the cross-referencing of energy prices with home thermostat settings via the internet, or some other combination isn’t clear. But it’s likely that a lot of home energy companies are taking a very close look at Honeywell’s lawsuit to see if its patent claims might apply to them, said Eric Lane, patent expert and GTM contributor. Lane took a quick scan of Honeywell’s patents, and noted that they seem to include some features that aren’t linked specifically to the thermostats themselves. “We’re not just talking about hardware; we’re talking about software as well,” he said. That could have a bearing on just about every smart thermostat play out there. Startup EcoFactor makes software to control and analyze thermostat data from the cloud, for example. Tendril, EnergyHub, Energate and other home energy management startups have cloud-based platforms for managing the interaction of home energy devices and utility power-pricing programs. And then there are cloud-based home energy management platforms like the one Lowe’s launched with startup AlertMe last month that could fall under scrutiny, given the fact that Honeywell has also accused Best Buy of infringing its patents by selling Nest thermostats and putting its Geek Squad to work installing them. Interestingly enough, Opower, the home energy analysis and customer engagement startup that’s working with Honeywell on a thermostat project, also recently launched a partnership with big-box retailer Home Depot. U.S. Patent No. 7,634,504 - "Natural Language Installer Set Up for Controller"
U.S. Patent No. 7,142,948 - "Controller Interface with Dynamic Schedule Display"
U.S. Patent No. 7,584,899 - "HVAC Controller"
U.S. Patent No. 7,159,789 - "Thermostat with Mechanical User Interface"
U.S. Patent No. 7,159,790 - "Thermostat with Offset Drive"
U.S. Patent No. 7,476,988 - "Power Stealing Control Devices"